There are 10 cities with a population of around 30,000 or more which are north of the Arctic Circle (latitude 66° 33′ 44″N) and therefore have at least one day per year when the sun never rises. All of these cities are in Russia (mostly the northwest) or Norway. In contrast, the largest city north of the Arctic Circle in North America is Barrow, Alaska, with only around 4,000 people. While the cities below are quite cold, most still have a milder climate than anyplace north of the Arctic Circle in North America. Kirovsk is a town in Murmansk Oblast, Russia, located at the spurs of the Khibiny Massif on the shores of the Lake Bolshoy Vudyavr, 175 kilometers (109 mi) south of Murmansk. The city is the center of a mining complex that produces apatite and nephelite, raw materials for the superphosphate and aluminum industries. The northernmost botanical garden in Russia is located in Kirovsk. Kandalaksha is a town in Kandalakshsky District of Murmansk Oblast, Russia, located at the head of Kandalaksha Gulf on the White Sea (the south of Kola Peninsula), beyond the Arctic Circle. The settlement has existed since the 11th century. The seaport connects Kandalaksha to the entire World and Kandalaksha bay is one of the major points of interest not only for the town but also for the Kola Peninsula. Monchegorsk is a town in Murmansk Oblast, Russia, located on the Kola Peninsula, 145 kilometers (90 mi) south of Murmansk, the administrative center of the oblast. A neat, fairly prosperous town set between several lakes, Monchegorsk makes a good base for exploring the centre and south of the Kola Peninsula - although the approach from the south is hardly encouraging as you pass through expanses of stunted or nonexistent vegetation, and then encounter the enormous Severonikel Kombinat factory whose past sulphur emissions are responsible for the ecological devastation. Nickel smelting here ceased in the late 1990s but it will be a while before the environment recovers. 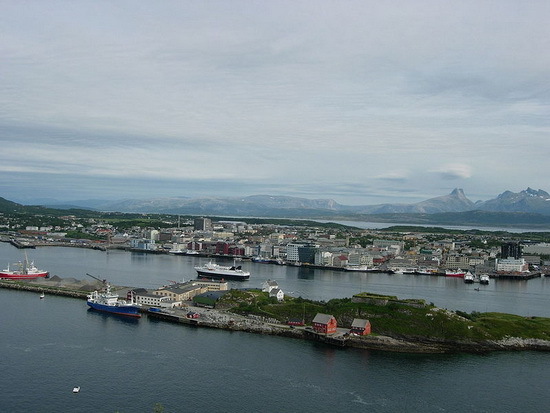 Bodø is the administrative centre of Nordland County. With its 47 000 residents it is the second largest town in Northern Norway, with excellent communications and fully modern facilities. Bodø is the perfect base for visiting some of Norway's most famous attractions, including Saltstraumen, the world’s strongest tidal current, the Svartisen glacier and the islands of Lofoten. Here you will also find Norway's national Aviation Museum. Despite its location just north of the Arctic Circle, Bodø features a subpolar oceanic climate, with chilly (but not cold) winters and cool summers. 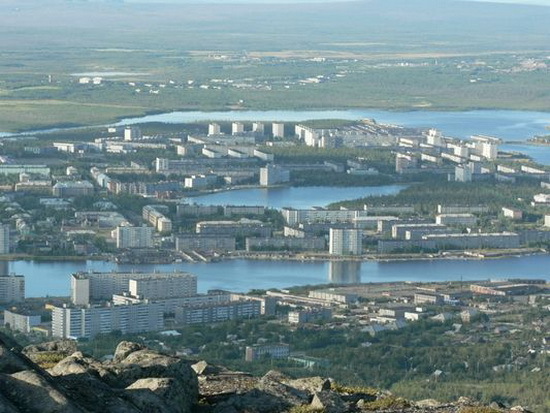 Severomorsk is a closed town located along Kola Bay, not far from Murmansk. It’s the main base of the Russian Northern Fleet and home of many surface ships. Its residents are mostly officers, their families and sailors – people who are involved in it in one way or another. No strangers at all. That’s why there is virtually no criminality and one feels absolutely relaxed walking along its streets at night. People are very friendly, most of them are intelligent and polite. Located in the center of the Kola Peninsula, the city of Apatity lies between beautiful "Imandra", the largest lake in the Murmansk region, and the Khibiny mountains, whose highest peak, Yudychvumchorr, stands 1200 m (3.900 ft) above sea level. 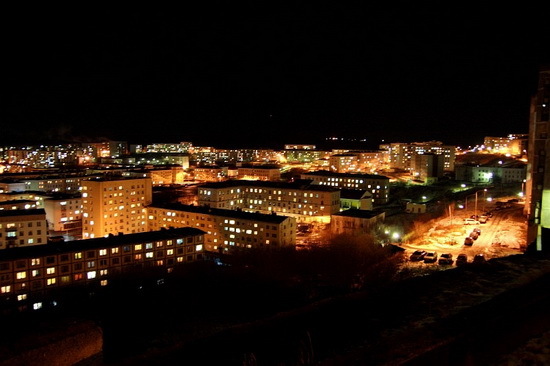 Apatity is the second largest city in the Murmansk region, with a population about 60,000. Founded in 1966, the city was named for one of its most abundant natural resources, apatite, the raw mineral used in the production of phosphorous mineral fertilizers. 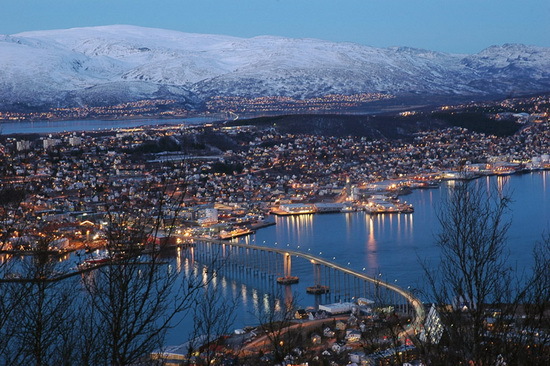 Tromsø is a city in the very northernmost part of Norway. Here you find art, history, sophistication, good food and an infamous nightlife in a bustling, tiny city. All of it, though, is surrounded by spectacular scenery that is visible from everywhere in town. It is almost 350 km (217 mi) north of the Arctic Circle and is one of the best places to view the spectacular Northern Lights in winter. The city is home to the world's northernmost university, as well as research institutes and satellite based industry. The population is therefore highly skilled, but retains the straightforwardness and sense of humour that the North is known for. Tromsø experiences a subarctic climate because winter temperatures are just cold enough to qualify and the summer season is short. 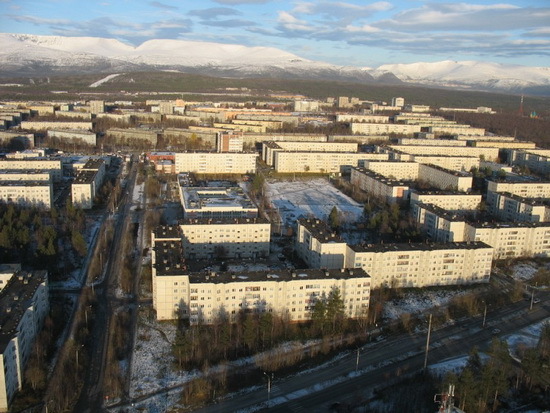 Vorkuta is a coal-mining town in the Komi Republic, Russia, situated just north of the Arctic Circle in the Pechora coal basin at the Usa River. It had its origin in one of the more notorious forced labor camps of the Gulag which was established in 1932. 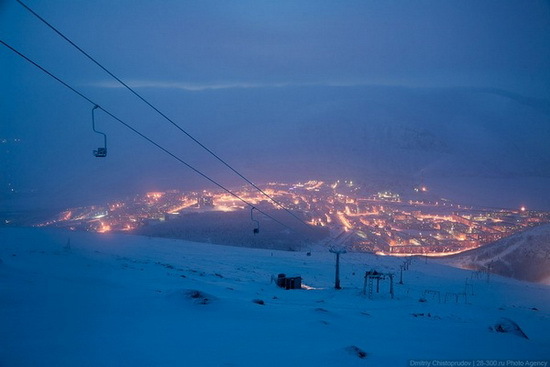 Vorkuta has an arctic climate with short, cool summers accompanied by very cold and dry winters. Average January temperature is about -20 °C (-4 °F), and July is about +13 °C (55 °F). Norilsk is the northernmost city in Siberia and the world's second largest city (after Murmansk) north of the Arctic Circle. The area is home to nickel ore smelting, and produces 1% of the whole planet's sulphur dioxide emissions. There are no trees living within 48 km (30 mi) of one of the main smelters, due partly to toxic rain from the four million tons of metals and poisons released into the air every year. 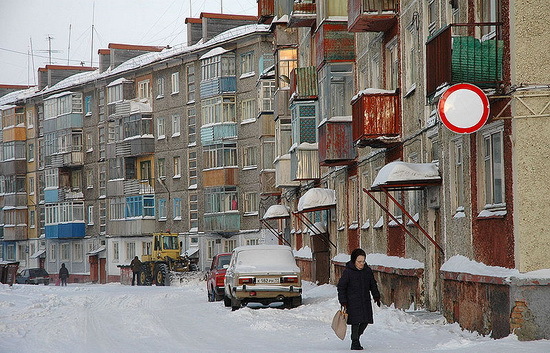 Norilsk has an extremely harsh climate. Average February temperature is about -35 °C (-31 °F), and July is only about +12 °C (54 °F). 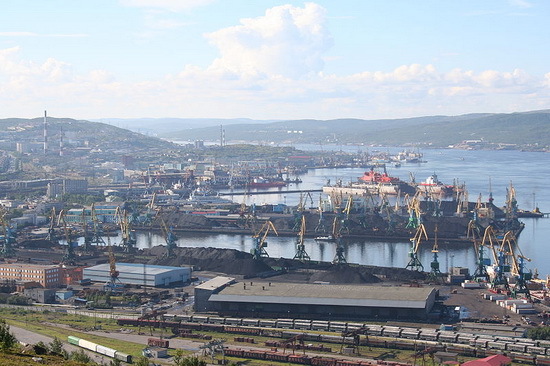 Murmansk is one of Russia's most important seaports and naval bases. It is located north of the Arctic Circle, on the Barents Sea and on the Kola Peninsula near Russia's borders with Finland and Norway. 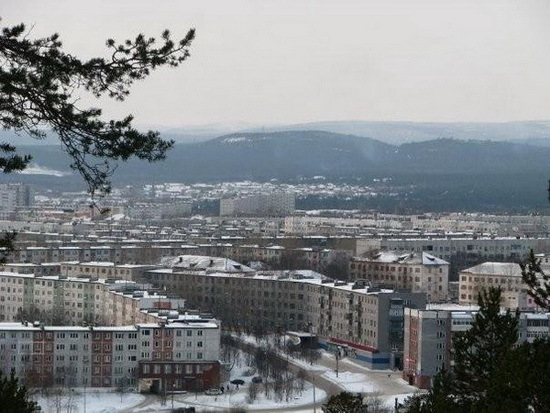 Murmansk is a strange city in many ways: it is above the polar circle, so it endures weeks of total darkness in the winter and enjoys weeks of 24 hour sunshine in the summer. It is above the tree line; the trees peter out a couple of hundred miles to the south. It is above the 10 degree isotherm; that is a line drawn around the arctic where the average June temperature is 10 degrees Celsius or less. And last but not least, despite cold winters, the sea doesn't freeze (because of the Gulf Stream). Go in winter, and you can have air temperatures of -16 degrees Celsius, with great clouds of steam coming off the water and hanging over the port area as fog. Good reading. Rovaniemi, Finland almost qualifies with its ~60 000 habitants but it's technically _on_ the circle not north from it. "Rovaniemi is located at the Arctic Circle Lat: N 66º 32’ 38.34""
And it's about 60.000... It could at least appear as the eleventh, at least to include a city (big enough) from another country. In fact, its aiport is divided exactly in two halves by the artic circle. What's up, just wanted to mention, I enjoyed this article. It was inspiring. Keep on posting!